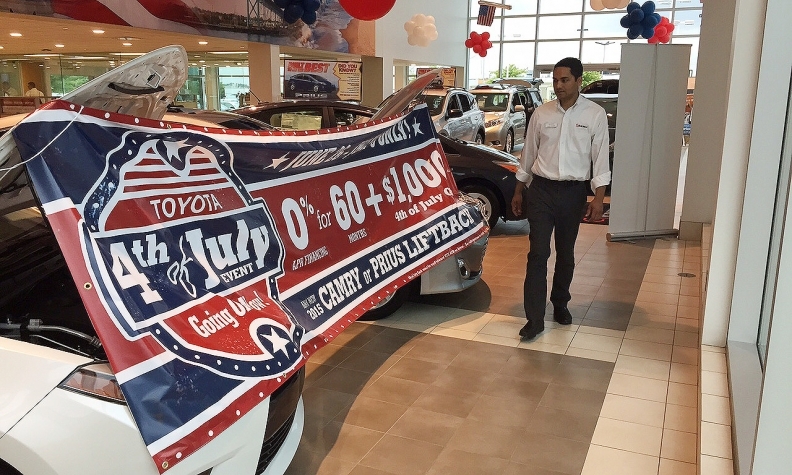 Despite incentives, including zero-percent financing, U.S. demand for the midsize Toyota Camry fell 8 percent in June, which Toyota blamed on changing consumer appetites. Boosted by strong light-truck volume, Toyota Motor Sales U.S.A. rebounded from a dip in May sales to post a 4.1 percent gain in June. Echoing a trend seen across the industry for the entire year, Toyota Motor is riding a wave of robust pickup, SUV, minivan and crossover sales, which were up 18 percent in June, enough to offset a 6.2 percent decline in car sales. The automaker sold 209,912 vehicles in June. “Light trucks have boosted the industry to its best first half since 2005,” said Bill Fay, Toyota Division general manager. Toyota Division’s sales rose 3.7 percent to 179,953 last month, making it the No. 1 retail brand in June, the automaker reported. Toyota Division light-truck deliveries rose 17 percent. Standouts included the Toyota Highlander crossover, up 20 percent; 4Runner SUV, up 43 percent; and the aging Tacoma midsize pickup that Toyota will replace in coming months, up 31 percent. Yet Toyota, like many other automakers, is seeing some of the easy light-truck sales come at the expense of cars. Demand for the midsize Toyota Camry was down 8 percent in June, which Fay blamed on changing consumer appetites. “It’s just caught up in a lot of the consumer trends that are moving to light trucks as opposed to anything else,” Fay said of the Camry during a conference call with reporters. Of all the cars the Toyota brand sells, only the Yaris posted a gain in June. Sales of the subcompact hatchback shot up 113 percent over June 2014, continuing its robust growth since March of this year. Corolla, Camry, Avalon and Prius deliveries all slid. “Toyota perfectly reflected industry trends in June, with nearly every truck and SUV model up while nearly every car model was down,” said Karl Brauer, senior analyst for Kelley Blue Book. Lexus also relied on light trucks for most of its 11 percent sales gain over June 2014, with 26,121 vehicles sold in June 2015. The luxury brand’s car lineup barely moved the needle, rising 0.2 percent, with the midsize GS and full-size LS offsetting a sharp decline in deliveries of the CT hybrid hatchback and the ES compact sedan. Lexus’ light-truck sales advanced 25 percent, reflecting the all-new NX compact crossover and the GX midsize SUV. Deliveries of the aging and soon-to-be-replaced RX crossover fell 14 percent. The Scion brand managed to stem some of its losses from a month earlier. Sales dropped 17 percent to 3,838 in June, an improvement over the 22 percent drop in May.